Tired of back pain and shoulder discomfort? Love skiing but hate carrying skis? Looking for something that will remove the hassle of carrying your skis all over the mountain? You can stop looking! Our Adjustable Ski Shoulder Carrier Lash Handle Strap is the perfect product made just for you! - Size: 153x5x1cm / 60.2x2x0.4inch. - Designed to hold ski boards and poles conveniently. - Straps are adjustable for optimal comfort. It makes it easier to carry your skis and poles preventing back discomfort, strain and tired arms. - The strap is made of high quality, durable and heavy duty nylon material with strong magic tape closing. 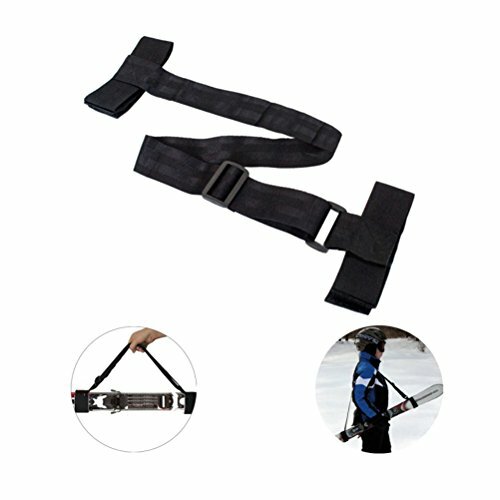 - This portable ski pole strap can easily fold down to a size that can fit in your pockets for easy carrying. This can be quickly unfolded and used whenever wherever you want. Material: Nylon. Size: 153x5x1cm / 60.2x2x0.4inch. Straps are adjustable for optimal comfort. It makes it easier to carry your skis and poles preventing back discomfort, strain and tired arms. The strap is made of high quality, durable and heavy duty nylon material with strong magic tape closing. This portable ski pole strap can easily fold down to a size that can fit in your pockets for easy carrying. This can be quickly unfolded and used whenever wherever you want.